Even if you follow all the Cardinal Rules of system security — you regularly update your operating system and programs, avoid spam like the plague and never click through on suspicious links and, of course, you use an antivirus suite — there may still come the darkest of computing days when your system is infected with malware. But how will you know? 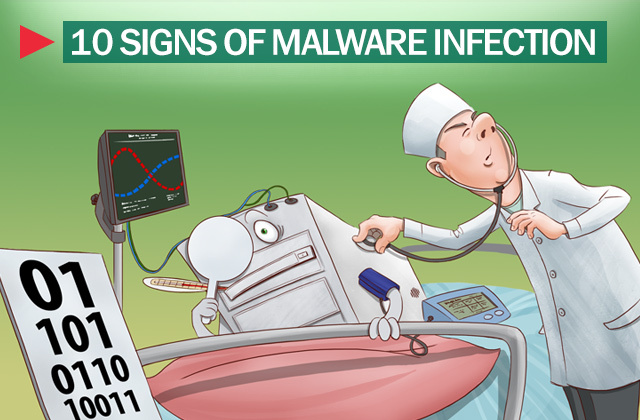 The following ten are signs can’t conclusively indicate that your system is infected, but they are red flags that it might be. Unexpected Crashes: If you’ve ever experienced this, you probably already know the hard way that your system crashing or regularly switching to the terrifying blue screen of death is a major red flag that something is very wrong. If it’s happening to you now, immediately scan your system for infections. Slow System: If you you’re not running any resource-heavy applications on your system but it’s running slowly anyway, it may be because your system is infected with a virus. Excessive Hard Drive Activity: Similarly, if you notice a lot of hard drive activity even when your computer is idle, this is a warning sign of a potential infection. Strange Windows: If strange windows pop up during the booting process, particularly those that warn you of lost access to various drives on your system, something is wrong. Peculiar Messages: If those troubling dialogue boxes crop up when your system is running alerting you that various programs or files won’t open, this is also a bad sign. Bad Program Activity: If your programs go missing, are corrupted, or start to open themselves without your initiation, and/or if you receive notification that a program is attempting to access the Internet without your command, this is a serious warning sign that you are the victim of malware. If you receive notification that a program is attempting to access the Internet without your command, this is a serious warning sign that you are the victim of malware. Random Network Activity: If your router is constantly blinking indicating a high level of network activity when you aren’t running any significant programs or accessing high amounts of Internet data, something might be wrong. Erratic Email: If your emails aren’t sent, or you hear from your contacts that they’re getting strange emails from you that you did not send yourself, this is a strong indication that your system has been compromised (or that your email password has been stolen). Blacklisted IP Address: If you receive notification that your IP address has been blacklisted, consider this about as sure a sign as any that your PC is not in good hands — there’s a very good chance it means your system has been compromised and is being used as one tentacle in far-reaching, spam-sending botnet. Unexpected Antivirus Disabling: Many malware programs are designed to disable the antivirus suites that would otherwise eradicate them, so if your antivirus system is suddenly not operating this could be a sign of a much larger problem. The surest way to know if your system is infected is to conduct a system scan with your antivirus suite. If you don’t have an antivirus, or if you think it may be compromised, you can download the free Kaspersky Security Scan and get your system checked out.